Lens Description: Ultra-wide angle lenses have always been in demand by architectural, corporate, and other top pro photographers. This new lens features completely redesigned optics including 2 high-precision Aspherical elements and two totally new UD-glass elements. The result is superior image quality: better contrast and sharpness at the outer edges, and a reduction in chromatic aberrations that can sometimes be seen with high-resolution digital SLRs. Its diagonal angle of view is an impressive 114°-anything larger would be a Fisheye lens. It has a built-in lens hood, and has been dust- and moisture- proofed. The lens uses a rear focusing system, high-speed CPU, and a powerful ring-type USM with revised electronics for faster, more responsive AF. 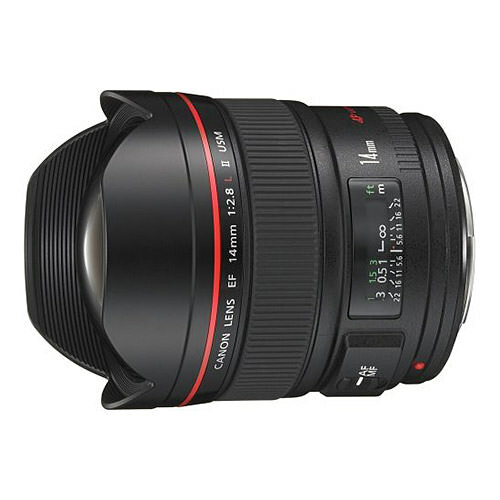 This lens continues the proud tradition of superior clarity optics found in L-series Canon lenses. I’m primarily and bird and wildlife shooter. My bread and butter lens is the superb EF 500mm f/4L IS II USM on a Canon 5D MKIV body, with the wonderful EF 100-400mm f/4.5-5.6L IS II USM, hanging off the other shoulder on a 5DS-R. In a small bag on my back, I carry the EF 24-105mm f/4L IS II USM and the gem of a lens and subject of this review, the EF 14mm f/2.8L II. I’m an opportunistic landscape shooter. I’m often out at sunrise and sunset and often find myself in beautiful locations that demand documentation. I almost always shoot hand held. Through Getty, I’ve sold images to Travel & Leisure, Wall Street Journal, Boston Globe and others. I first became enamored with ultra-wide angle lenses after I picked up a Sigma 15/f2.8 diagonal fisheye and then the Canon version of the same lens (the Canon is much better). I found myself using those lenses a lot, for big-sky shots, or close foreground shots, with big background. I would de-fish the resulting images with DxO Optics Pro. It didn’t keep some of those images from selling, but I was upset with smearing in the corners that resulted from the de-fishing process and some imperfections in those lenses. I really started Jonesing for an ultra-wide that was crisp corner-to-corner. As a member of Canon Professional Services, I’m able to borrow lenses for short auditions. I borrowed the 14/f2.8 and the very impressive EF 11-24mm f/4L USM. Both lenses impressed me very much. Optically, they were very close and I could have lived with the image quality of the 11-24mm, particularly since I use the lens correction of DxO Optics Pro to remove most geometric distortion at every aperture, focal length and body combination. What tipped me toward the 14mm prime was it’s compact size. I believe, “If you’re not going to carry it, don’t buy it.” Most of my shooting is done with the 500mm on one shoulder, the 100-400mm on the other shoulder and that small backpack, with the two lenses mentioned, plus my EF 1.4x TC-III, my EF 2.0x TC-III and an EF 25ET. The 11-24mm could have fit, but it’s large and heavy. I did some comparison shots at 11mm vs. 14mm and didn’t find the difference important for me. If I weren’t lugging the 500mm most of the time, I probably would have opted for the 11-24mm, just for the added flexibility. After I made my decision to go with the 14mm, I posted a review on one of my Forums, a car Forum no less, and one of my online buddies said that he was selling his 14mm for $900, because he’d just moved from Canon to Leica and wanted to liquidate quickly. $900 is like 40% of “street value”, so I jumped right on that deal. The lens was like-new and I have absolutely no regrets. The-Digital-Picture.com does lens comparisons. I looked at these before I bought. Recently, Zeiss just came out with a manual focus 14mm Milvus lens. Milvus is their top category lens. The Canon beats the Zeiss and certain apertures, such as f/5.6. In most comparisons, they were tied. Check out the comparison for yourselves. Ultra-wide lenses are not everyday lenses, but when the clouds are spectacular over a spectacular landscape, then nothing else will do. I’ve always got mine with me.